East Fallowfield Township municipal offices are located at 2264 Strasburg Road, Coatesville PA 19320; phone: 610-384-7144. Photo: Robert Steen House, ca. 1846, Fairfield Road, East Fallowfield Township, Chester County, PA. Listed on the National Register of Historic Places in 1985. Photographed by User:Timothy Colgan (own work), 2012, [cc-by-3.0 (creativecommons.org/licenses/by/3.0)], via Wikimedia Commons, accessed September, 2016. East Fallowfield has an rich inventory of properties listed on the National Register of Historic Places. 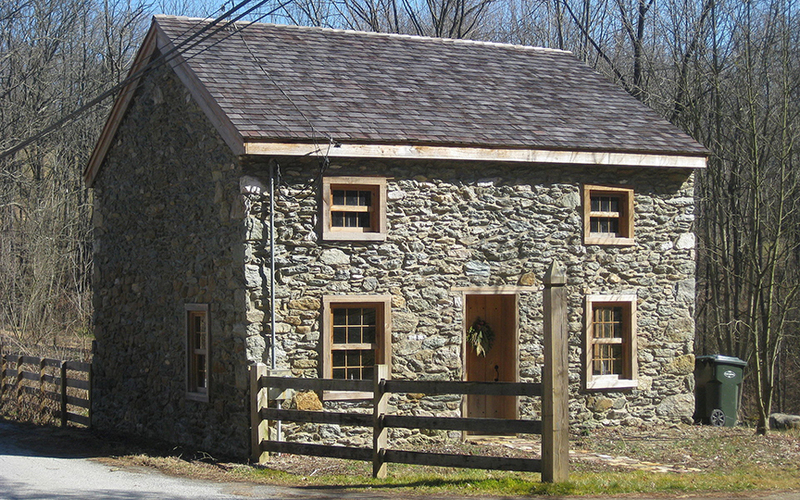 These include the Doe Run, Ercildoun, and Glen Rose Historic Districts, homes of Edward Dougherty, Philip Dougherty, Harry DeHaven, Jesse Bentley, Joseph Gladden, Isaac Pawling, Martha Pennock, John Powell, Joshua Pusey, David Scott, Thomas Scott, Robert Steen, Joshua Vaugh, Asa Walton, John Wentz, Robert Wilson, & Robert Young; also, the Philip Dougerty Tavern, Mortonville Hotel, Powell Farm, Hanna Farm, and the White Horse Tavern. Arguably, the most curious of these historic resources is the Lukens Pierce Octagonal House [1, 2]. The octagonal house is a two-story structure built of field stone covered with stucco. It has a slate roof and octagonal cupola with transom windows; the eaves of both the roofs of the house and cupola are decorated with wooden Italianate brackets. The floor plan consisted of four large rectangular rooms in four small triangular rooms on each floor used as closet or storage space. The rooms opened into a centrally located circular stairway with narrow handrails and slender spindles. The kitchen was located in a one-story addition to the house and an original two-story addition has been removed. A veranda that has also been removed, extended along five or seven sides of the building. The windows are six-over-six sash, and the first floor window openings have been altered, possibly indicating they might have been doors to the veranda. The kitchen has been moved to the northwest side of the house, baseboard electric heat installed, and other interior alterations undertaken by the present owners. The octagonal house was built in 1856 by Lukens Pierce, one of America's first nurserymen. [See: Ercildoun Historic District.] Pierce started his nursery In 1854 and turned the venture into a profitable business. By 1861, he was advertising Italian Bees, fruit trees, grape vines, berry plants, and evergreens and deciduous trees. Pierce died in 1872 leaving an estate of about 150 acres, containing his nursery and octagonal house. His obituary noted that he was probably more extensively engaged in the nursery business than any other person in America. The octagonal house is also significant in that it is probably the only one of its kind in southeastern Pennsylvania. Octagonal houses are generally found in the orchard and vineyard regions of New York and Ohio. It is significant in its connection with Lukens Pierce, but neither the house or man is mentioned in studies of multi-sided buildings or in histories of American horticulture. Strassburg Road (which crosses the township east to west from Mortonville to Stottsville) was the main transportation and commercial corridor through the township for almost 150 years. More than a dozen significant, surviving historic resources located along the route have been generously documented. East Fallowfield has a namesake in Crawford County, PA.